Release Date: July 6th, 2007 (Quad Cinema) by Roadside Attractions. The Cast: Jake Moreno, H.P. Mendoza, L.A. Renigen, Sigrid Sutter, Brian Raffi, Gigi Guizado, Larry Soriano, Paul Kolsanoff, David Scott Keller, Allison Torneros, Paula Baldin, Jim Wierzba, Kat Kneisel. BASIC PREMISE: Billy (Moreno), Rodell (Mendoza) and Maribel (Renigen), three friends in Colma, California, struggle to make sense of their lives after high school. 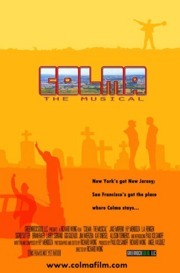 ENTERTAINMENT VALUE: Unlike the deeply heartfelt, indie musical gem Once, Colma: The Musical amounts to nothing more than a oddly refreshing, quirky musical drama set in Colma, California, a small town outside San Francisco. Billy, Rodell and Maribel recently graduated high school and spend their time aimlessly partying. The wafer-thin plot basically follows them as they wander around the town while trying to find something more interesting to do than smoke, drink or sleep. Billy finds a job in store mall and meets a new girlfriend, Tara (Sutter), at a party, although he can’t stop thinking about his ex-girlfriend (Kniesel). It turns out that both Billy and Tara happen to be share the same passion for acting in theater. Maribel and Rodell have pent-up issues with one another while Rodell has issues of his own regarding his relationship with his strict father, who flips out when Rodell comes out of the closet. Each actor and actress gives a decent, believable performance whether they sing or act. Screenwriter/songwriter H.P. Mendoza has a knack for writing songs with interesting lyrics, but whenever the characters merely speak, some of the dialogue feels slightly awkward. If this were just a straightforward drama with no music, it would have been quite dull, but, fortunately, director Richard Wong breathes plenty of energy into Colma by including some lively musical numbers as the characters break into song. INSULT TO YOUR INTELLIGENCE: A wafer-thin plot and slightly awkward dialogue. IN A NUTSHELL: A lively, oddly refreshing musical drama with a wafer-thin plot and slightly awkward dialogue.